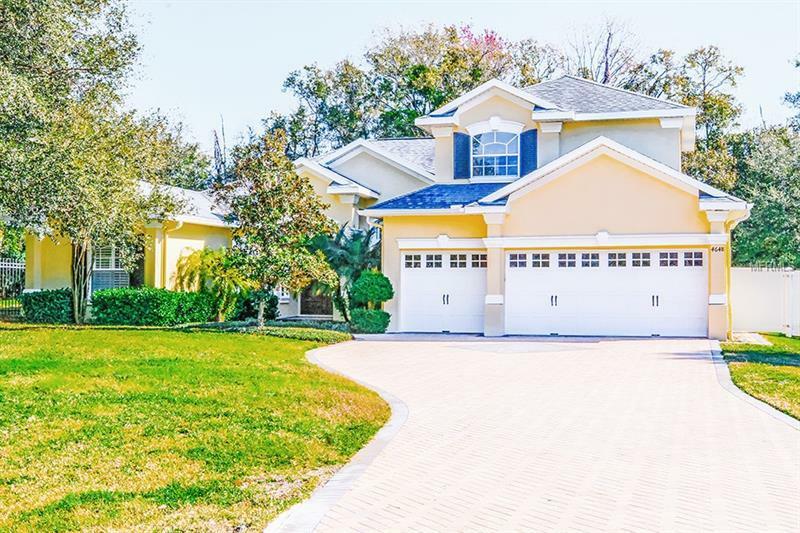 Hidden gem nestled in a gated community, one way street, 16 custom homes on.5 acre. 4 bedroom, 3 1/2 bath, 3 car garage with study and bonus room. House is upgraded, recently painted inside and out, new carpet in bonus room. New drain field, new 5T, 16 seer AC with warranty.House has 2 AC units. New water heater. New washer and dryer with utility sink.Water treatment system Traxx, chlorinator, iron filter. Paver driveway and lanai. French door and sliders all open to lanai which is plumbed and stub out for outdoor kitchen.Kitchen is a show place with stainless steel appliances, warming drawer, wine chiller and a dry bar. Solid wood cabinets and granite counters, truly magazine worthy kitchen. Bonus room new carpet and would be a perfect theatre room with a 1/2 bath. Living room upon entering front door has a gas fireplace for cozy nights. High ceilings and tray ceilings, large walk in closets in Master, master bath is truly resort feeling. The 4th bedroom has entire wall of built ins with bathroom leading to outside. Bedroom 2 and 3 have separate bathroom in middle. Family room has built in entertainment center---------This house lends itself to outdoor living and looks out to wooded area, very private, serene. This is a must see, private, secluded neighborhood, don't let this one get away, it won't last long. Everything you could want, turn key. . Courtesy of Jordan Ashley Realty, Inc.